FloorSkills apprenticeships are delivered on a block release system; apprentices will attend training on alternate months, averaging 3-5 days per block release. 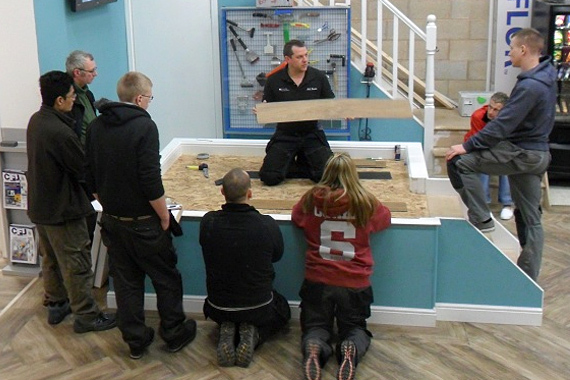 FloorSkills believe the best way to learn is to complete a full installation from start to finish, this includes the apprentices preparing their own area ready for installation, right through to the finishing touches. FloorSkills do not pre-prepare or part install the area for the students. • Stretch fit textile to include stairs, winders, open plan stairs, BN steps, joins etc. • Contract textile installation to include direct stick and dual stick systems. • LVT to include, straight lay, diagonal lay, border work and designs. The apprenticeship is delivered over an average of 18 months, varying to suit individual apprentices needs. After approximately 18 months the apprenticeship moves onto the EPA Assessment process. What is an EPA Assessment? FloorSkills will be constantly assessing the apprentice’s ability throughout the apprenticeship and tailoring the training to suit the individual. Mock assessments are completed and additional training provided as necessary to ensure the apprentice is ready for the EPA. The EPA assessment can be carried out at any approved EPA centre or at FloorSkills by an independent assessor, where FloorSkills will look after the whole process making it trouble free for the employer and the apprentice. What will the apprentice achieve? Level 1 and/or Level 2 Functional Skills.